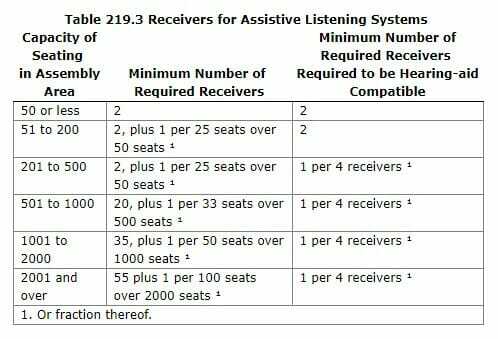 Assisted Listening Systems (ALS) are required to be provided in assembly areas per both the ADA and 521 CMR. These devices range in capability and technology but ultimately provide the same service to persons who are hard of hearing. There are four (4) types of systems that are typically used – Radio Frequency (RF), Infrared (IR), Induction Loop, and, in more recent years, Wi-Fi. The terminology required to understand ALS can be overwhelming. To more readily grasp these requirements, basic definitions are provided below. Hearing Aid – a personal device worn either in the ear or behind the ear that amplifies sound; can have a “T” switch to toggle the T-Coil on/off. The ADA requires a minimum number of receivers based on the total number of seating with an additional set of receivers that are hearing-aid compatible (see Figure 1). In the state of Massachusetts, the requirements are more stringent. 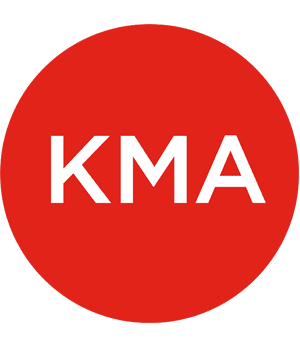 MAAB §14.5 requires the minimum number of receivers provided to be 4% of the total number of seats, but no less than two (2) receivers . To compare, an assembly area with a total of 2001 seats requires 70 receivers under the ADA versus 80 under MAAB. One of the most interesting takeaways from the ALS seminar was that the baby boomers seemingly do not associate themselves with the ADA. In other words, it seemed as if they didn’t correlate their hearing impairments as a disability but rather a natural cycle of aging. To be fair, hearing loss is common in the aging community, however, it was intriguing to witness this disconnect. Many in the audience joked at the irony of requiring so many hearing devices in a space where no one uses them. Another common joke was that Americans tend to hide their flaws/disabilities from the rest of the world. Take eyewear for example – the impairment of vision has become a symbol of fashion or presumed intelligence. Hearing aids, however, haven’t achieved that cachet just yet. They are widely associated with the elderly, regardless of the multitudes of children and young people who use them as well.